Two perspectives that are closely linked to the topic of film form are formalism and realism. Each has a particular view of what film should be for and how it can achieve its purpose. Formalism began to take on coherence in the 1920s in the Soviet Union, and its two key theorists were Sergei Eisenstein and Rudolf Arnheim. The theorization behind realism gained strength during the 1930s and its later proponents included André Bazin and Siegfried Kra-cauer. Although the debate between these perspectives may not have really taken off until the 1930s, there has always been a division in the ways in which the medium has been used. Between 1895 and 1901 the films of the Lumière brothers aimed to record scenes from everyday life, while Méliès used film as an expressive medium that centred on the importance of mise en scène in the construction of fantasy. Formalism emphasizes film's potential as an expressive medium. The available film techniques are of central importance - use of camera, lighting, editing. For the formalists, film should not merely record and imitate what is before the camera, but should produce its own meanings. Primary importance is attached to the filmic process, and it is suggested that film can never fully record reality anyway, if only because it is two-dimensional compared to reality's three dimensions. We have already looked at examples which can be described as formalist in the work of Eisenstein and Hitchcock. The Odessa Steps sequence from Battleship Potemkin consists of montage editing. Eisenstein was not content to merely show us what happened on the Odessa Steps; instead he expressed the meaning of the events through the choice of shot content and the way he edited the shots together. He produced meaning from a dialectical process between shots, by producing associations from shots, by using symbolic shots, all of which requires the viewer to make sense of what is seen, to think through a sequence. Eisenstein wrote of the editing of shots: '[t]he juxtaposition of these partial details in a given montage construction calls to life and forces into the light that general quality in which each detail has participated and which binds together all the details into a whole' (Eisenstein, 1942, p. 11). The shower scene from Psycho uses a formalist strategy of montage editing. The scene is not shot and edited in a continuous, linear style. The meaning and effect come both from the content of shots, namely a knife flashing across the screen at different angles towards Marion Crane, and from the editing of the shots, which produces a series of short shots that juxtapose the knife and Marion with their different directions of movement. Further examples of formalism are to be found in German Expressionism. Films such as The Cabinet of Dr Caligari (1920) are non-realist: the expressive nature and meaning of these films tend to rely upon the mise en scène, on the selection and arrangement of elements within shots. It will be noticed that the formalist approach to film-making necessarily emphasizes the importance of the director as someone who intervenes in the film-making process. In other words, a film is a vehicle for personal expression. Realism, by contrast, emphasizes film as a medium for directly recording what the camera 'sees'. Film techniques are important, but not for producing meaning within the film. The function of the camera is to record what is in front of it and to allow the content to speak for itself for the audience to draw their own conclusions. Bazin believed realist cinema was a more democratic form of film in that it did not manipulate the audience. The use of deep focus allows the audience to clearly perceive a number of elements within a shot instead of being guided towards a particular element. 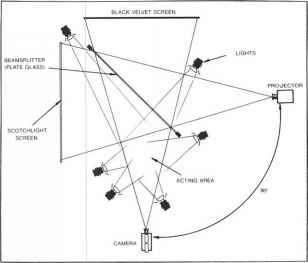 The use of long takes reduces the need for intervention by the director in the construction of the film. Less editing means less fragmentation of time and space. Film is seen as having the potential to reveal the world to audiences. 'For the first time, between the originating object and its reproduction there intervenes only the instrumentality of a nonliving agent. For the first time, the image of the world is formed automatically, without the creative intervention of man' (Bazin, 1967, p. 13). This Bazin quote comes from an essay entitled 'Ontology of the Photographic Image'. Ontology is central to any kind of realism, concerned as it is with the 'reality status' of objects and representations. Is a documentary more 'real' than a Hollywood film? Can any film be 'real'? What does 'real' mean'? These are not idle questions: from personal experience we can affirm that many people (in response to a direct question) think of soap operas as 'real'. The ontological question is in turn linked to the matter of epistemology, which is about the meaning of 'knowledge'. How do we know what we know? Again, this question is much deeper and more far-reaching than it may appear: do I 'know' something because I have experienced it (empirically), because I have sensory (phenomenological) information about it, or because I believe what I have read or heard... or seen in a film or on TV? What is realism and formalism in film?